Get Free Shipping in the U.S. for Wildcraft! When our son Rowan was little, we always wanted to play the nature and cooperative games with him. However, he always pulled out Candy Land or Chutes and Ladders. Then it hit us! Why not make a nature-based educational game featuring all the things kids love about those timeless board games? Also, why not make cooperative play even MORE fun than competitive play? Wildcraft! was born! Now, everyone can share their passion for plants with their kids and grandkids in a way that brings everyone together. randma needs huckleberries to bake a pie. You and your cousins embark on an adventure up the mountain to collect berries as well as herbs she uses. Wildcraft! teaches 27 important healing herbs and edible plants. Wildcrafting is the harvesting of wild plants. The game also teaches teamwork, for you will rely on each other’s knowledge of plants and good fortune to make it to the Huckleberry Patch and safely back to Grandma’s. Wildcraft! is a beautifully illustrated, nature-based, cooperative game created in the tradition of the classic board games. What do kids love most in board games? Remember the slides, short cuts and ladders in Candy Land or Chutes and Ladders? When you were a kid playing board games, weren’t these your favorite parts? Well, Wildcraft! has waterfalls to slide down, logs to cross and deer trails to wander down. 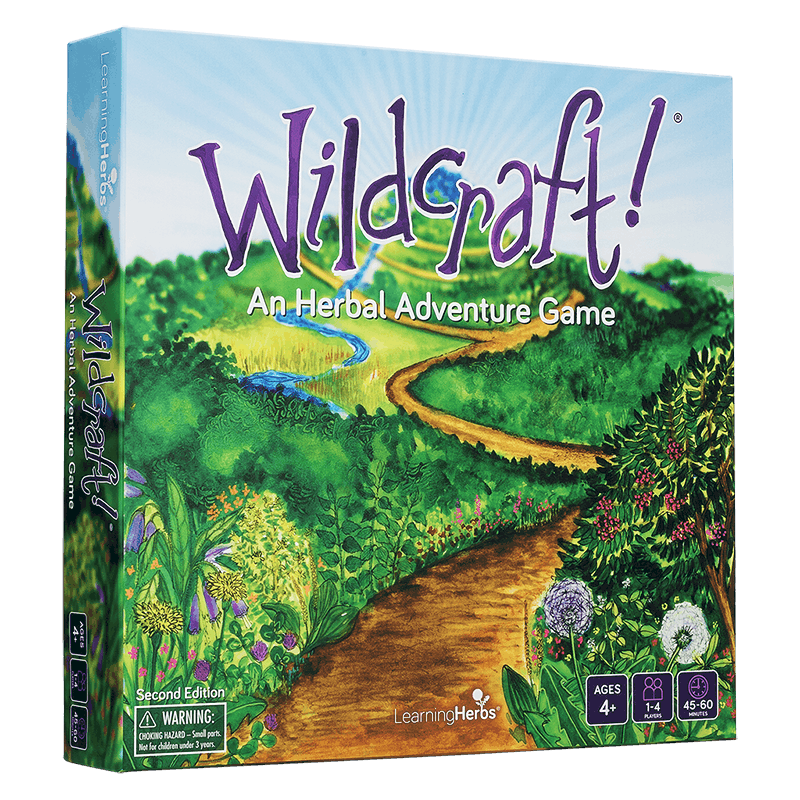 We designed Wildcraft! in the tradition of the classic board games. 27 plants are featured on 54 cards. There are 52 trouble cards. The icons on these cards match up with the icons on the Plant Cards. That’s how you know what plant can help with your trouble card. This way, even little kids can play! This beautifully illustrated and fun story takes your kids on a journey that teaches them safe and sustainable plant harvesting, hazards, endangered plants, delicate ecosystems, and more. These important herbal and ecological teachings are woven into the game in a way that’s playful. The Wildcraft! Story is an additional layer of fun that is built into the gameplay. Read this optional story whenever you feel like learning a little more. 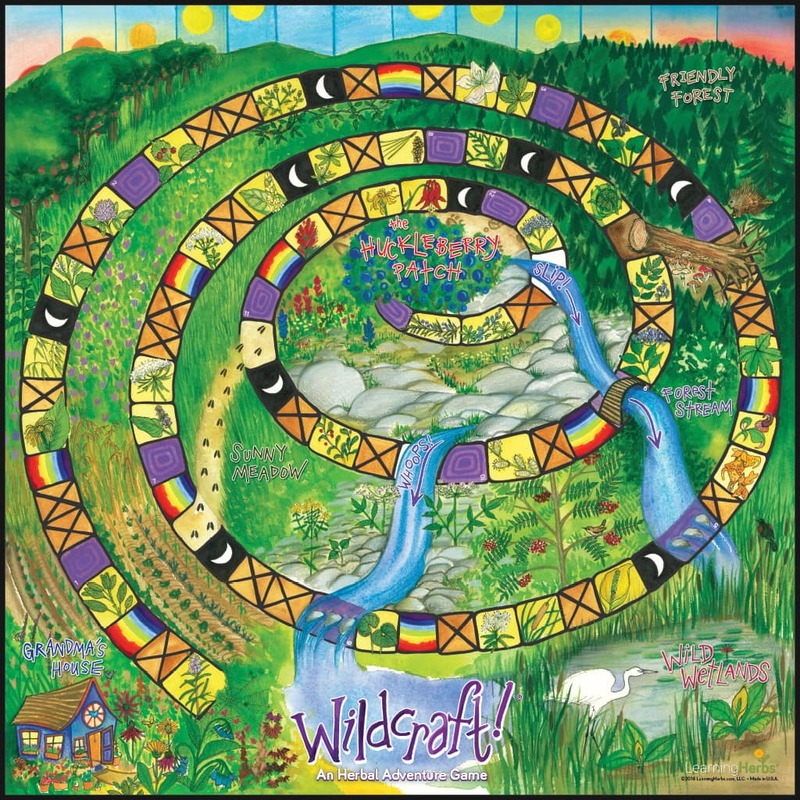 You get access to this printable PDF immediately after you purchase Wildcraft! How do you actually use the Wildcraft! plants in real life? This handy guide explores all 27 plants in the game. Each page has a beautiful botanical illustration that points out key identifying characteristics, as well as a quick reference that shows what each herb is used for. Fun little stories help your kids remember all the details. This is one of the best herbal field guides for kids, and you get this printable PDF as a bonus with Wildcraft! This is not just any coloring book. It’s a fun learning tool! In addition to the 27 coloring pages, this printable coloring book includes full color, botanically correct pictures of each plant. This will help your kids learn the identifying characteristics of all the plants in the game. When your family is out on a hike, your kids will more easily recognize the plants that can help them. What Parents Love about Wildcraft! The game brings you through several ecosystems while you are going up the mountain. Plants on the board are positioned in the ecosystems they would naturally grow in. Therefore, players are learning about plants, where they grow, and what to use them for on several levels. Well, this is obvious, but we wanted to mention that the game teaches plant uses on a food and first aid level. Chronic health issues are not addressed. How to properly use the plants, when to pick them, and what parts to use are not addressed in the game. Wildcraft! keeps it simple and keeps it safe! Since the game is “icon” driven, once your child has played once or twice, they can play on their own. No reading is required. Older kids and adults will get A LOT from this game. However, even if your 5-year-old isn’t reading, they are “patterning” on what the plants look like and what you can use them for. You can also make up simpler rules for the wee ones. And NO prior knowledge of plants is needed. A portion of the proceeds from this game benefit United Plant Savers. Their mission is to protect native medicinal plants of the United States and Canada and their native habitat while ensuring an abundant renewable supply of medicinal plants for generations to come. Wildcraft! brings you through several ecosystems while you are going up the mountain. Plants on the board are positioned in the ecosystems they would naturally grow in. Therefore, players are learning about plants, where they grow, and what to use them for on several levels. Wildcraft! is great family fun. Gather up the kids, bring out the board game, and learn about medicinal and edible plants in the most fun way imaginable. This is wonderfully cooperative game where everyone is a winner and everyone learns something about plants! Wildcraft is a blast! Green cooperation, herbs, healing, eating and lots of fun. If only I had this when I was growing up in London, I might have become a herbalist by now…. I love your herbal game! A youngin’ I played with took to the game like a duck in water. No reading of the rules really needed. He was bouncing all over the place finding the herbs which matched his troubles and so easily giving cooperation to others to help them move up the board or identify and give them needed herbs. The herb drawings are wonderful – just enough detail to recognize – the uses for the troubles great with the variety of possibilities, the colors vibrant, the play cooperative, teaching, fun and suspenseful all wrapped up together in one fun time!!! I found a game I love the best. My daughter and I play this more than any other board game in the house. Now she remembers more about herbs from our wilderness walks. At age six, she knows more binomial spelling than any school curriculum covers. She learned telling time from the way the moon moves, we both laugh at our “troubles” on the path and delight in our creativity as we use whatever herbs we gathered to heal each other. Everyone in our family says “Yes” to spending free time on An Herbal Adventure. Plus, concern for Grandma, the role-playing, and the visual beauty of the game spark our love of Art and family. After years spent playing and teaching cooperative games from the Findhorn community, I found a game I love the best. I teach herbs and find this a very easy and non-intimidating way to get everyone looking at their “weeds” differently. Helps people to learn that some of those so called weeds, are actually quite useful. A wonderful introduction for anyone who is even remotely curious about a safe game for all ages where everyone comes out a winner. I enjoy it as a fun family game once in a while, and use it for fun classes for my herb students who are just beginning, and as a refresher of common basics to the more advanced. If you have an avid outdoors person, camper, hiker, child, gardener or anyone who is outside or heck – alive – then consider this safe, fun and learning game. Wildcraft! is our family’s favorite game for the wholesomeness of its purpose: hiking in a woodland setting to pick huckleberries for pie at Grandma’s house. All along the way, identify and collect native growing herbs that can be used for healing any ailments that come up along the way. Our family loves playing this game and it has encouraged us to get out in nature and recreate the game in real life. This is not a watered down pointless child’s game, but one that in infused with meaning and purpose. Nature awareness and appreciation is sorely lacking and this game introduces it in a very engaging way. Reading is not required because of the symbols for young children to match the illustrations with one another. I bought this board game for myself (50 years old) because I learn best through pictures and interactive material and I wanted to learn more about herbs. My 4 year old niece LOVED it and was faster than me in identifying the herbs that helped with different remedies. She is very competitive so it was great to have a game with a cooperative component in which all win as long as we help each other along the way. The game has a chutes and ladders type layout and is very beautifully illustrated. This is an amazing game to teach kids about herbs. The artwork is gorgeous, the game isn’t difficult to learn and it’s well worth the cost! So glad I found it! 5 Stars from Robin P.
This game is different from any other board game my family and I have ever played and we are avid game players. It is not competitive and yet leaves you with a sense of achievement when you are through. It is educational teaching us the various uses for different herbs we come across, leaving us with the desire to learn even more about herbs! Very beautiful art as well, not mention the game itself has many uses! This is not a corny game or hippie game. My conservative, hesitant, elderly aunt played it and loved it. Kids or people of all ages will learn alot and enjoy this game. Takes very reasonable amount of time to play. Keeps your interest and moves along well. I love that this game encourages cooperation rather than teaching kids to win at all costs. We have had this game for a few months now, and it is one of our kids favorite – and I love that we are all learning about herbalism each time we play. We go hiking and camping a lot, and its great to have a game that we can play during the rainy seasons that helps fuel our families love of the outdoors. I am always on the lookout for cooperative games and this one did not disappoint me. The game itself is gorgeous, and it’s also very educational. It allows my children to learn about herbs in a fun manner. I enjoy playing this game because I learn something too. Wildcraft! has many of the things I look for in a game… It’s educational, easy to use, beautiful to look at, you learn a lot about herbs…and you laugh a lot. If you are not satisfied, we will refund your money AND you can KEEP the game! We are so absolutely sure you’ll love this game, that if you don’t, we’ll refund your money and you can KEEP the game and bonus items. We are soooo proud of this product. Everyone who has played it, loves it.